It’s my Birthday a little early! Dad knows I have a long list of running gear I “need” and he was kind enough to send me money for my birthday so I could go shopping and pick out what I want! The one store I have been wanting to visit is Lululemon and since it’s in Seattle, and Sky and I are busy bees, I just haven’t made it up there. Mark had a presentation to go to in Seattle today, so Sky and I tagged along and shopped while he got educated about Genghis Khan and Mongolia. (He should know soon if he is going to Mongolia the end of the year, so this was good prep for him). It was really a wonderful day with Sky. She was adorable and charming, and most of all patient while I tried stuff on and shopped. Also, the sun was out! I really do love walking around downtown when it’s sunny and nice out. 1. Purely a girly purchase on my part. I have a few skirts that work well and are really good quality, but I LOVE the two tears of pleats this skirt has, and the shorts underneath are amazing! Most comfortable and well fitting of any of my other skirts. No this is not a picture of me in the skirt…I couldn’t take a pic and get the details to show up, so I got this from the website. The bonus features that I’m supper excited about are the zipper pocket in the back and two gel pockets in the waistband on each side. That means I will not have to run with my fuel belt. I still hate my fuel belt, so am thankful to have 3 pockets for my gel shots. 2. My first GPS running watch. I have gone back and forth on the “need” for a watch. I’m happy running with my phone and using the Runkeeper application. But, my phone started having issues playing MP3’s, and while I can use Pandora or Amazon Cloud, if there are clouds or trees I lose my connection to the music. So, I now run with Runkeeper on the phone, muted, and listen to the MP3 player I got for music. Its been working for me for months, until I started hitting 6 plus miles in my training runs. One thing about smart phones, the batteries don’t last when you are connected. Runkeeper uses GPS to track distance and pace and my phone can’t handle much more than 6 to 7 miles. And, I don’t like the idea of running with my phone for safety, only to kill the battery and not be able to make an emergency call. But, I was still having a hard time spending the money on the Garmin GPS watch I had picked out. It has a lot of bells and whistles I don’t care about and most likely wouldn’t use, but what I would use it for it would do a great job. So, after talking to the sales person at REI I ended up with this NB GPS Runner. It is pretty basic, distance, pace, and time and that’s about it. That’s all I really want though. She did make it clear this is new technology for NB and it may not work that great. I will give it a go this week and see what I think. 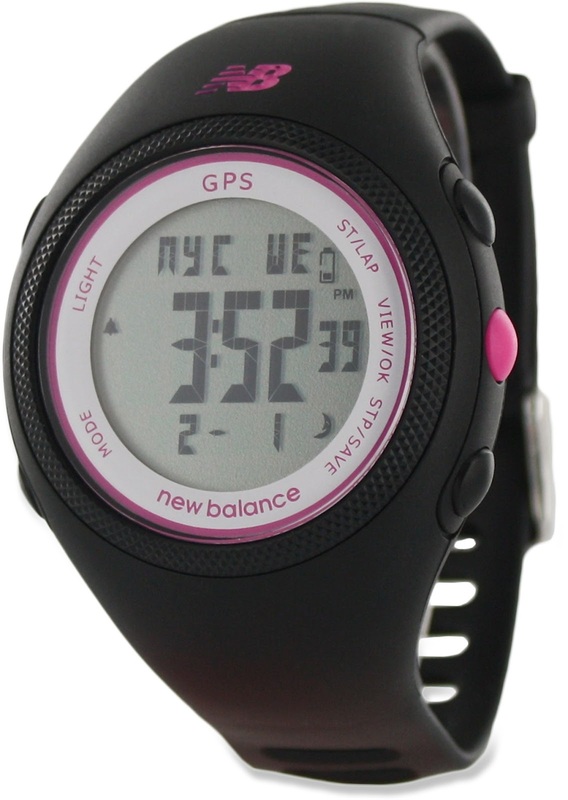 If the GPS takes too long to connect, or loses connection in cloud cover, tall buildings or trees then I will take it back and most likely upgrade to the Garmin Forerunner 405 that I have had my eye on. Thank you dad for the birthday money and in turn the running gear! Love you!